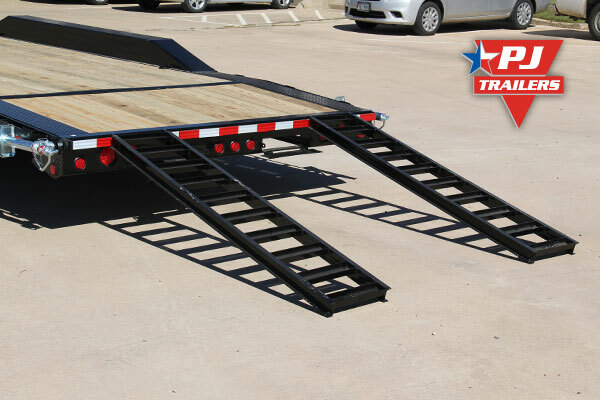 We offer optional ramps on a our 60" Utility Dump (D5) trailer. 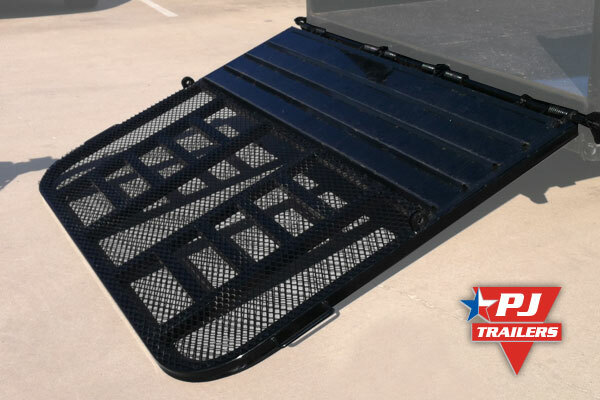 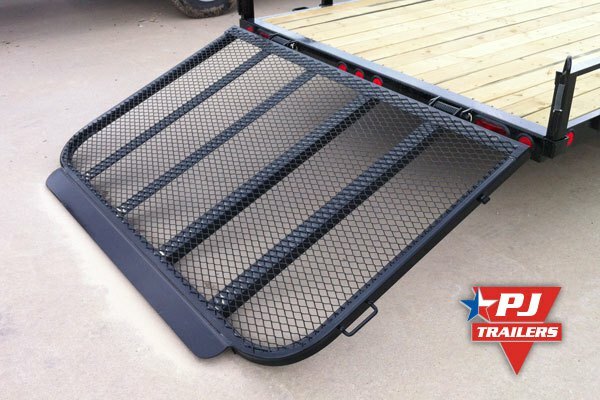 These ramps are great for loading ATVs, mowers, and other small vehicles into your dump bed. 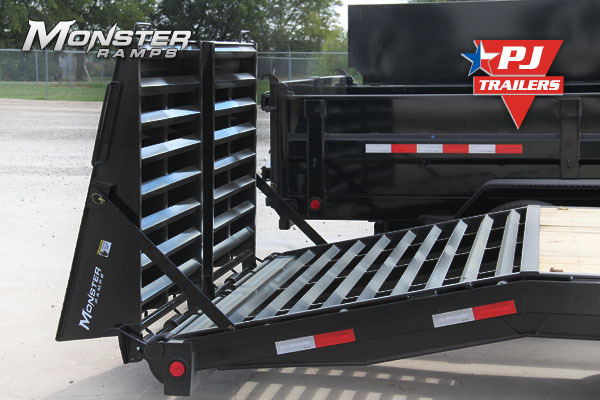 The ramps are stored on the side of the dump bed over the fenders. 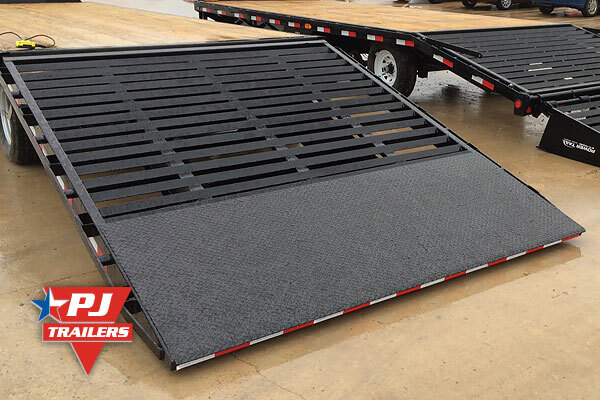 Everybody loves our 5 ft Monster Ramps so we created 4 ft Monster Ramps for our deckover trailer line. 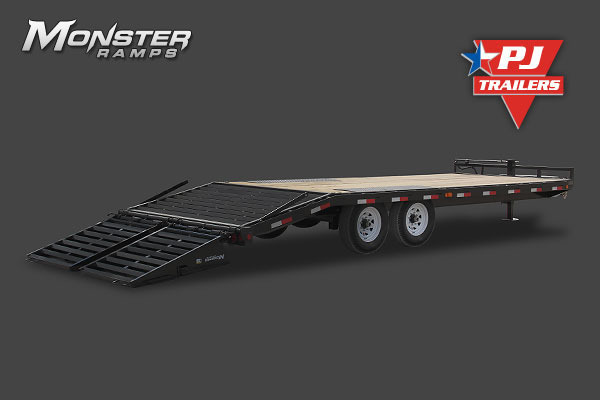 Monster Ramps give you an ultra-wide platform to load equipment and store flat to the deck when not in use. 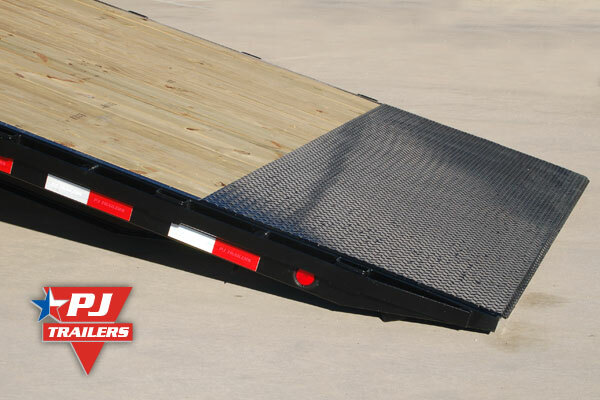 The ramps are spring assisted when lifting from the deck and from the ground, making them easy to handle. 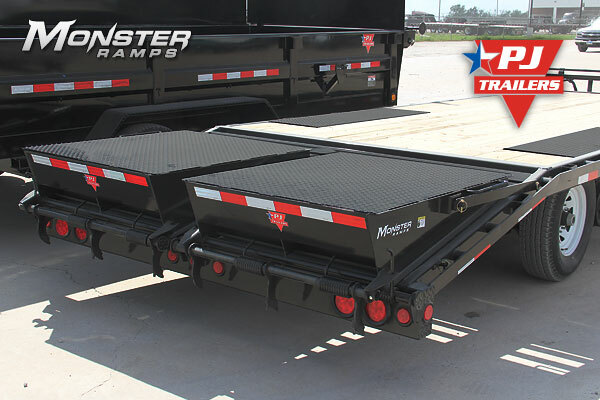 Monster Ramps are much safer than your typical 16-18" wide gooseneck ramp and give the driver/operator increased confidence when loading in wet weather. 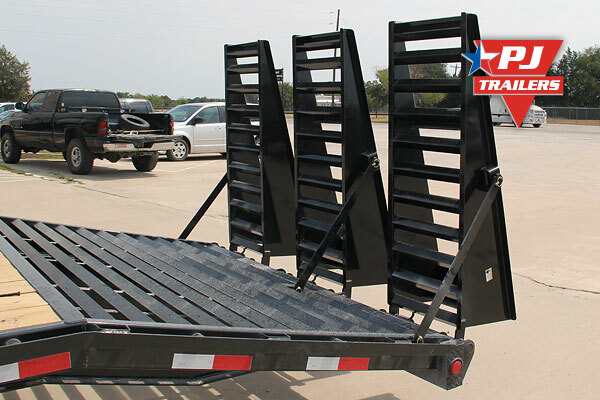 Rear slide in ramps are one of the most convenient ramp options for our car and buggy hauler trailers. 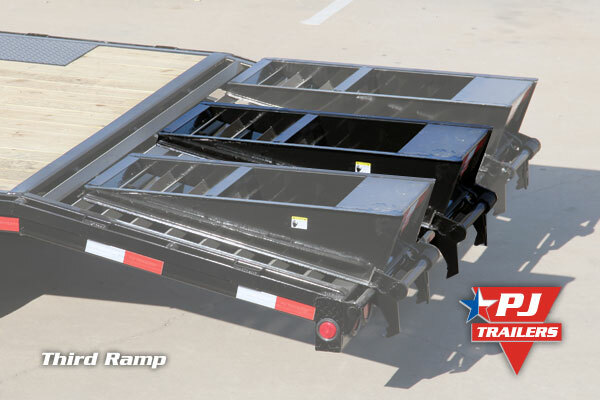 No longer will you have to remove a ramp from the side of the trailer and carry it to the rear bumper. 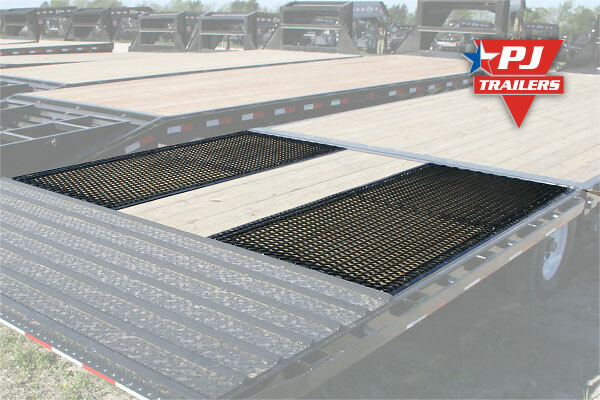 You simply open the rear ramp doors, slide your ramp out, and place it on the ramp support bar. 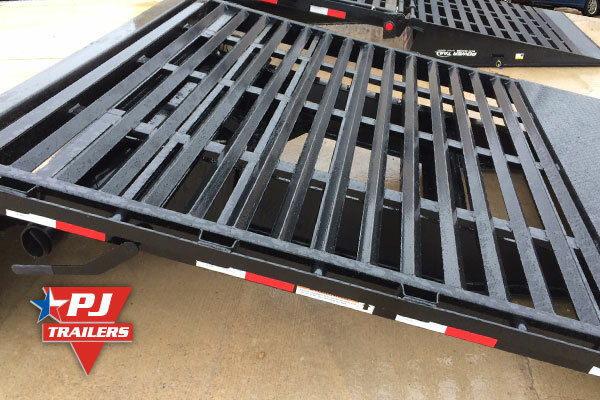 We offer expanded metal traction plates on our hydraulic dovetail models. 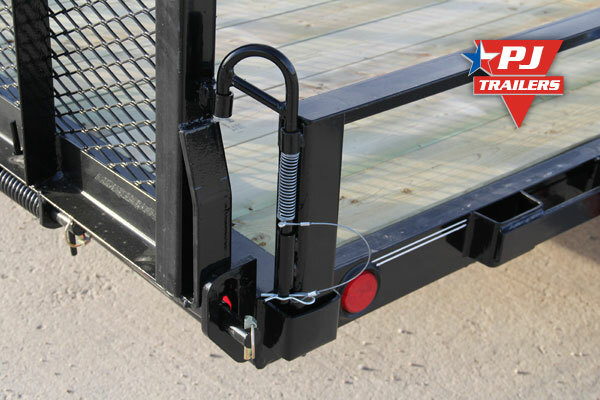 The plates cover the outside deck of the hydraulic dovetail increasing your traction. 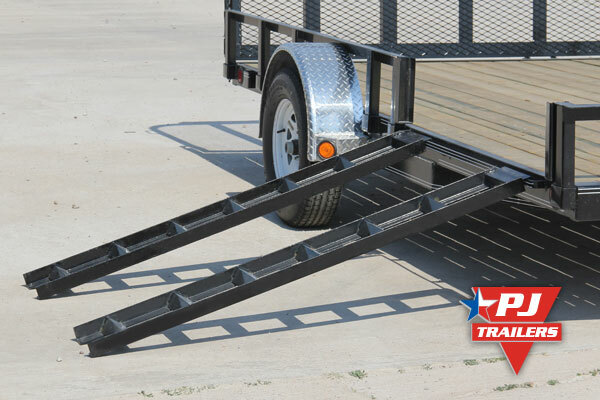 These 1" x 1" angle traction bars are welded to the rear of the trailer tail. 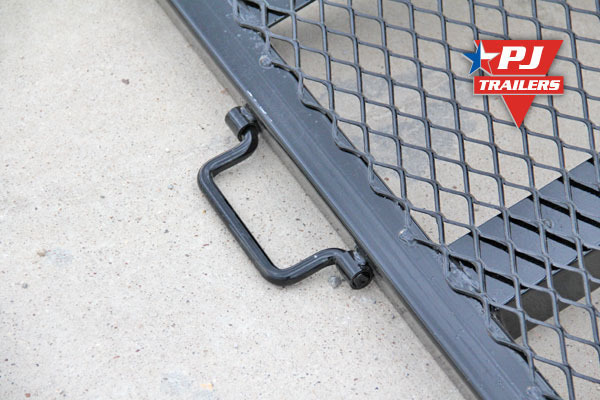 The bars significantly increase traction in wet and icy conditions. 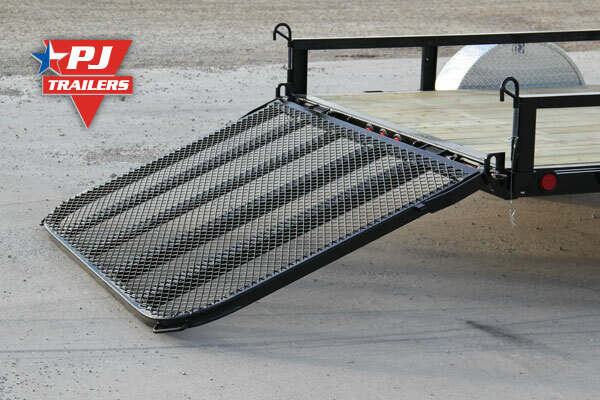 Our straight deck with slide-in ramps includes two 8 ft ramps that slide in ramp holders from the rear of the bumper. 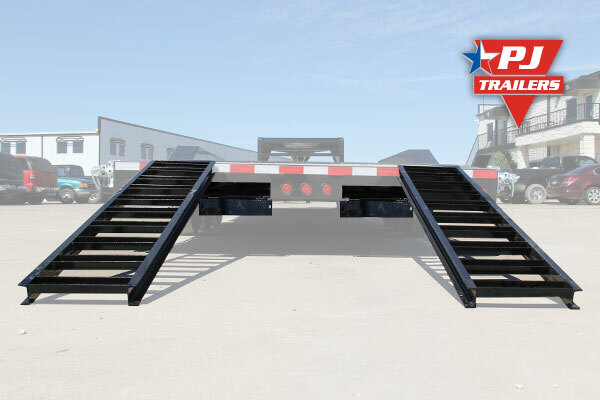 The load angle with these ramps 20° & 23° for the LD & FD respectively. 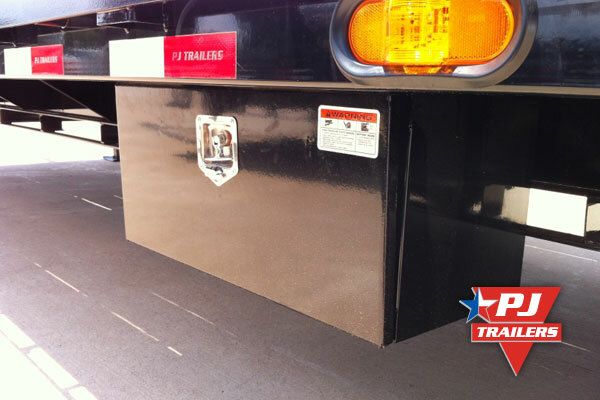 This is the standard tail option for the FS, FD, & LD models. 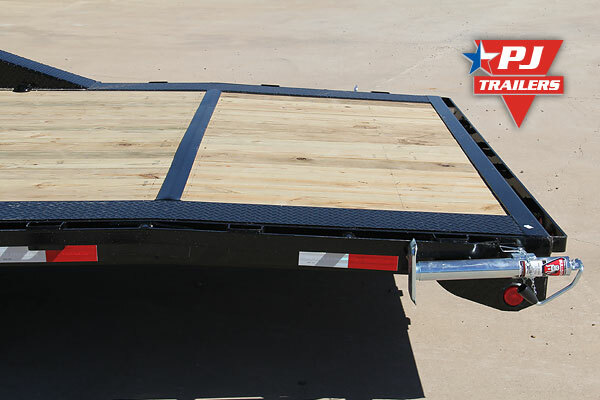 The 5' dovetail with three flipover ramps has been a popular choice for farmers. 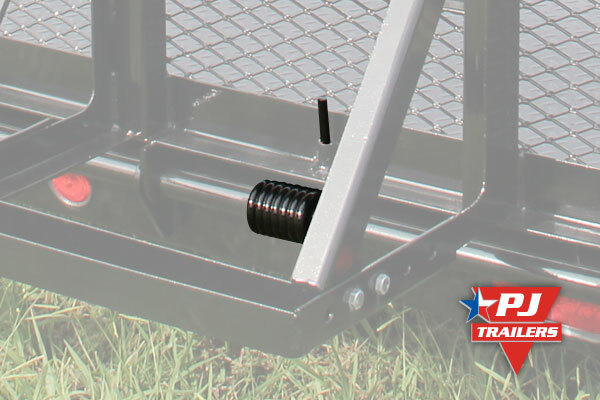 Three ramps make stacking round bales of hay possible and also allows you to easily load tricycle tractors. 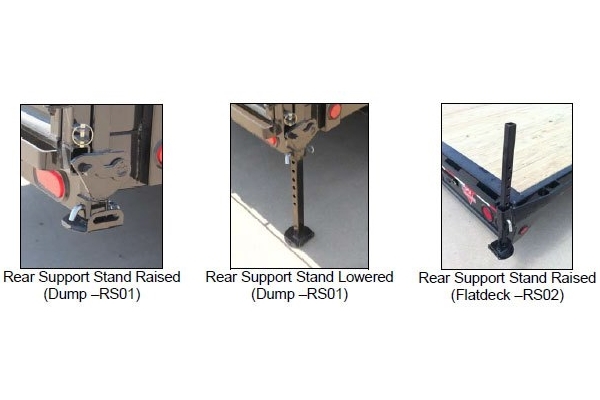 The photos below shows the ramps with the ramp support arm option (option code: z). 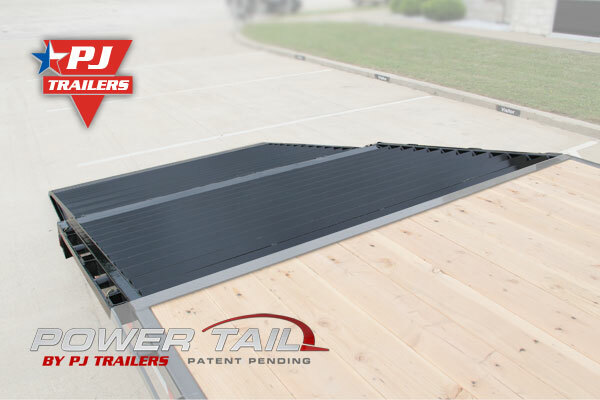 The Power Tail (patent pending) is a hydraulic powered trailer tail that replaces typical trailer ramps with a 100% powered ramp system. 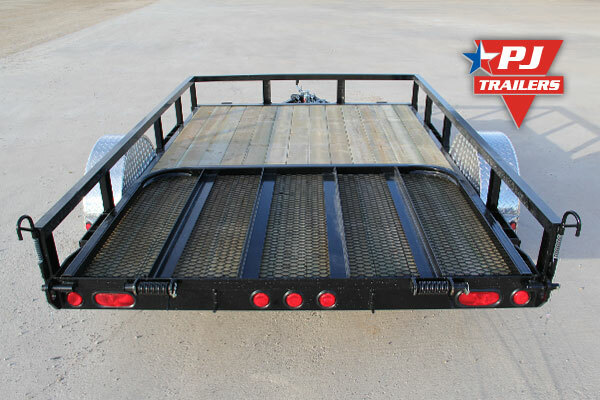 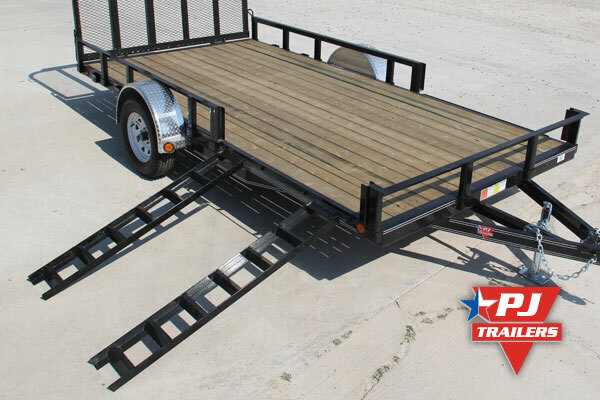 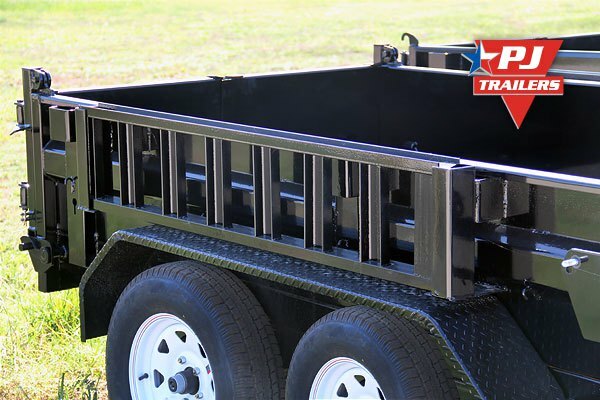 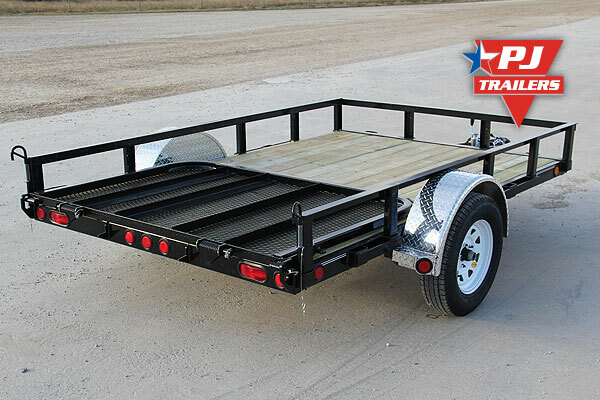 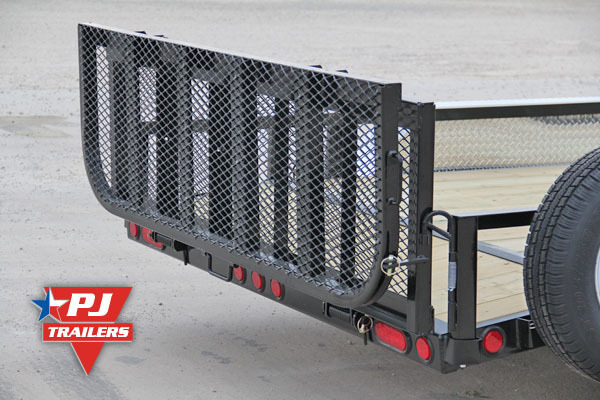 This allows you to make the trailer ready to load and unload at the touch of a button. 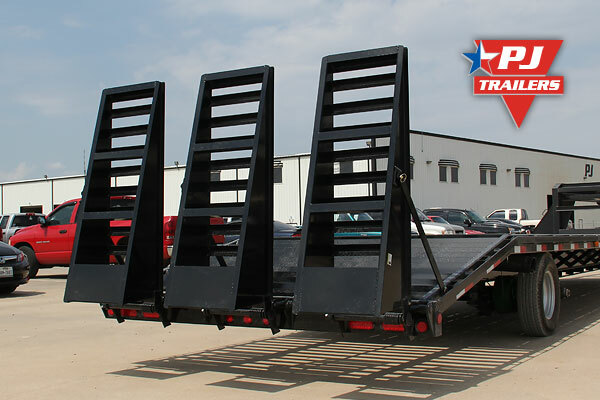 The tail rotates a full 180 degrees to serve both as a tail for loading and deck for storing cargo. 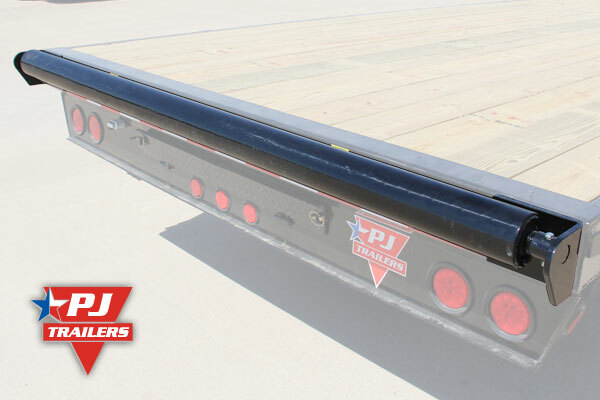 The PJ Power Tail is easier, safer, faster, and more reasonably priced than anything else on the market. 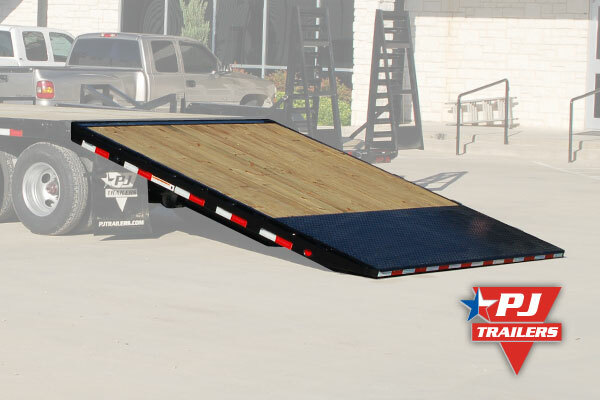 Gone are the days of physically flipping multiple ramps then carefully adjusting their position to load your equipment. 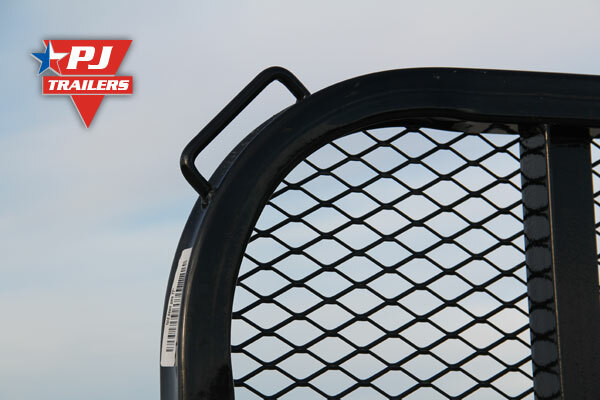 With the touch of a button you will be able to quickly raise and lower the entire tail, saving your back and your time. 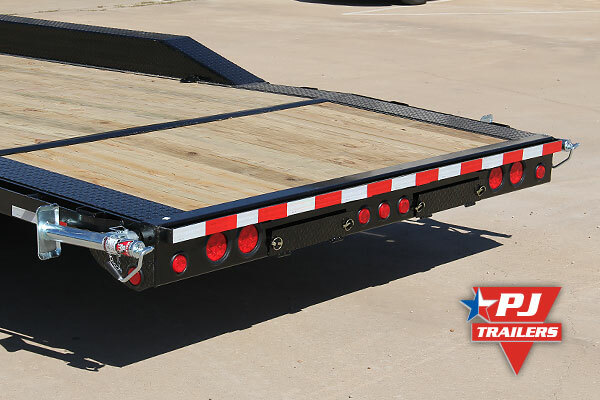 In the closed position the tail is completely flat, allowing equipment & cargo to be loaded on top of the diamond plate on the Power Tail. 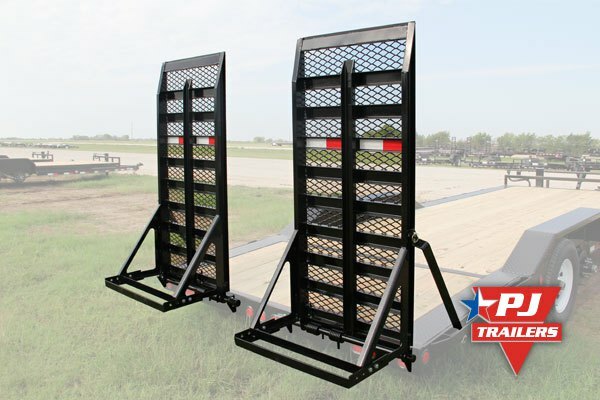 This also reduces wind drag significantly compared to stand-up ramps. 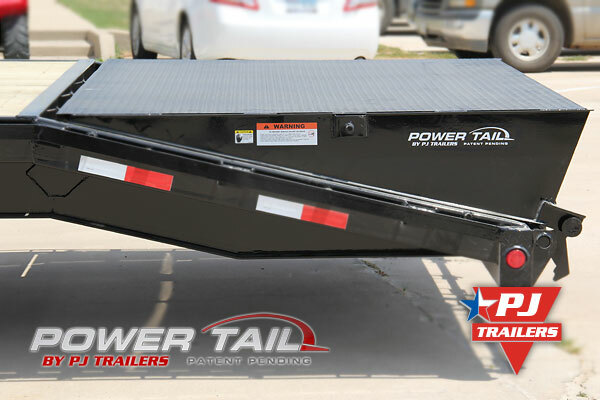 The super wide Power Tail gives you the confidence to load and unload equipment without the fear of missing a ramp. 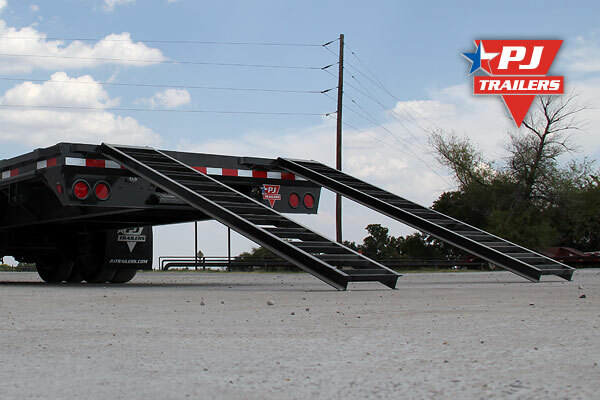 The angle cross-members are used on both the dovetail and Power Tail to maximize traction in all-weather situations. 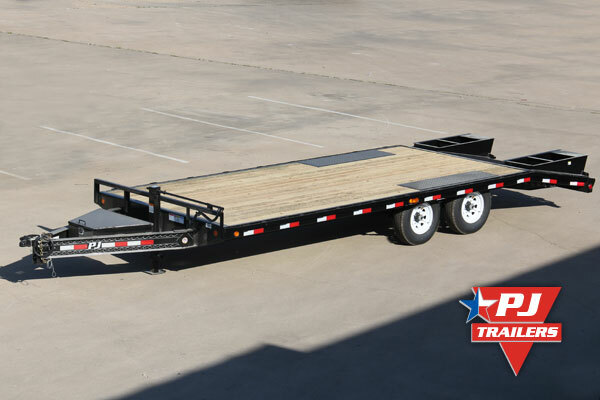 Also, the knife edge tail eliminates the initial "bump" when loading that can cause wheel spin. 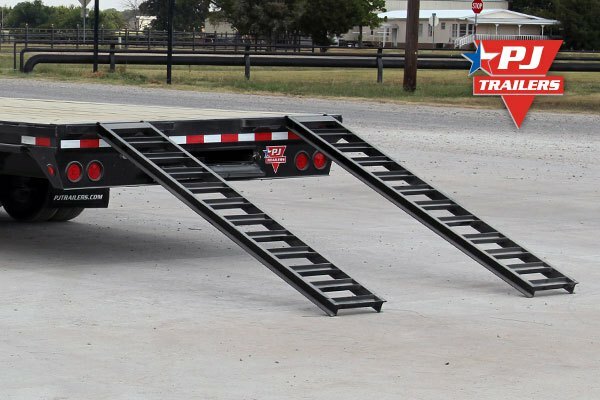 Since the tail folds flush to the deck, you don't have to worry about the 4-5 ft of tail overhang that is common on hydraulic dovetails. 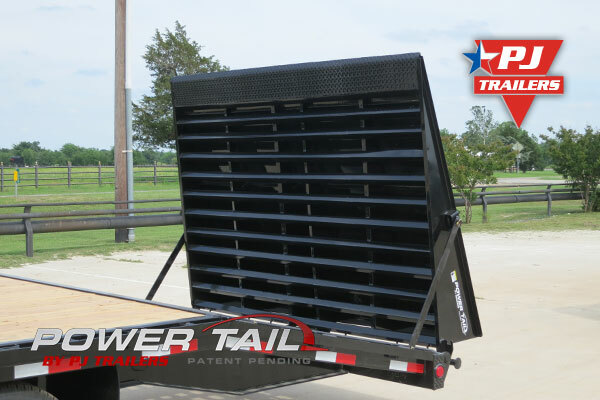 This fold-over tail and single cylinder design keep the Power Tail short and relatively light to maximize payload capacity. 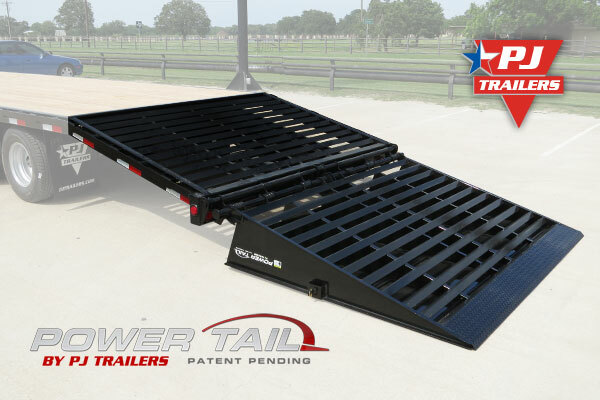 This allows the Power Tail to be installed on short 14k single wheel goosenecks (20 feet) all the way up to triple axle stepdeck trailers as long as 53 feet. 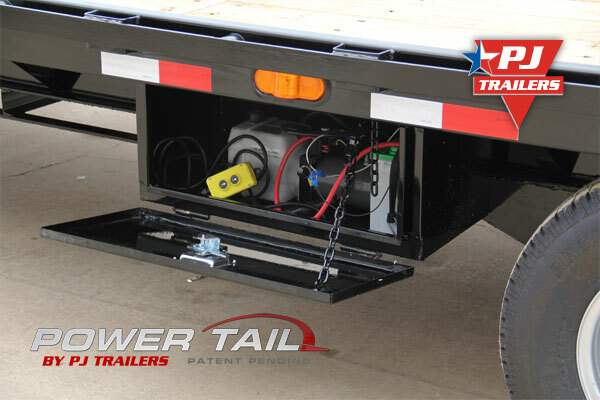 The Power Tail (patent pending) uses a single hydraulic cylinder to rotate the tail a full 180 degrees. 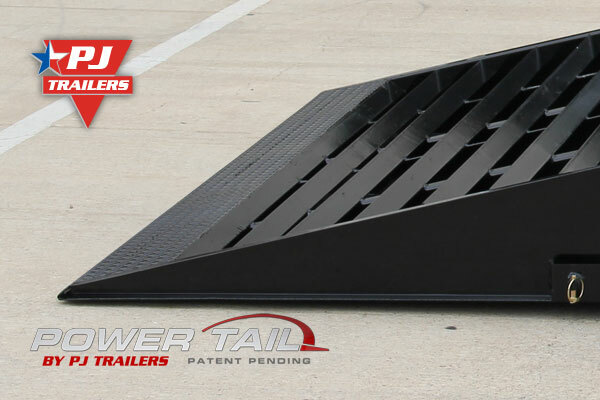 This ingenious tail design is very mechanically efficient, using just a few moving parts with no wasted movement. 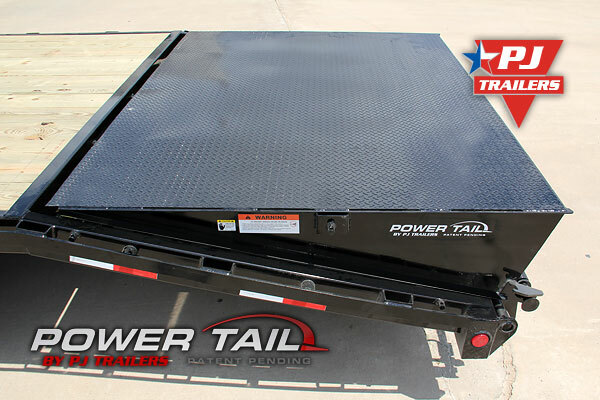 This greatly reduces the overall cost and weight of the Power Tail. 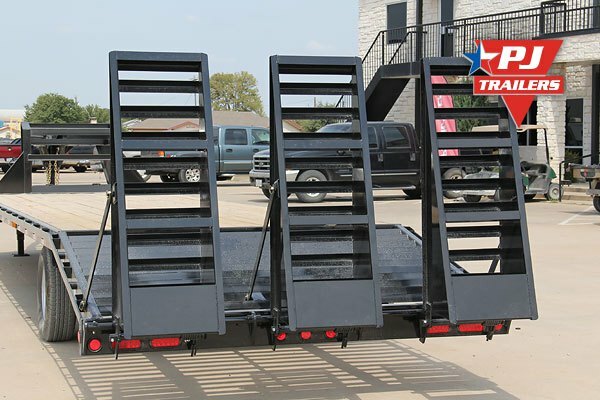 Our 4ft dovetail w/ flip over ramps give you all the loading benefits of a dovetail and the ability to load cargo (bales, pallets, etc) on the ramps. 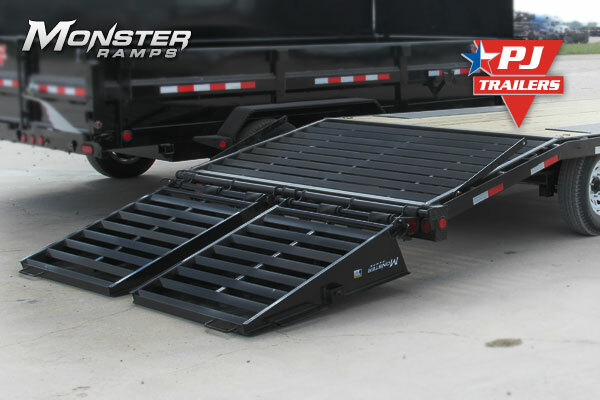 The ramps are spring assisted which makes them extremely easy to flip over. 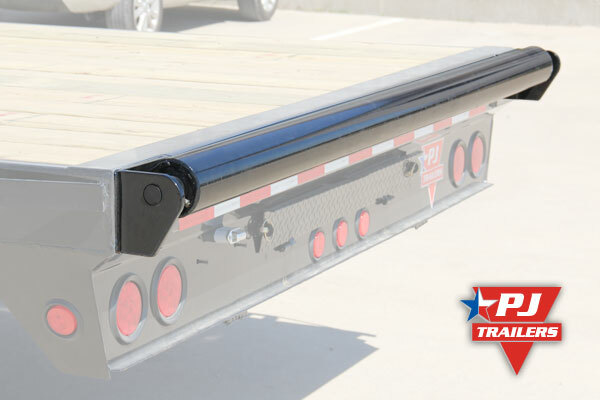 The 4 ft tail gives you increased rear bumper clearance over the 5 ft dovetail. 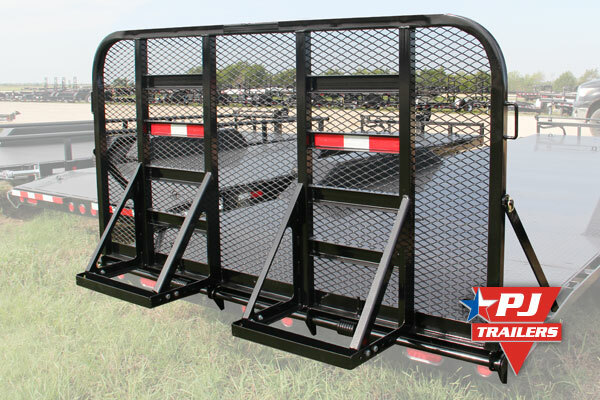 A great option for our 83" wide dump trailer is a dump side gate. 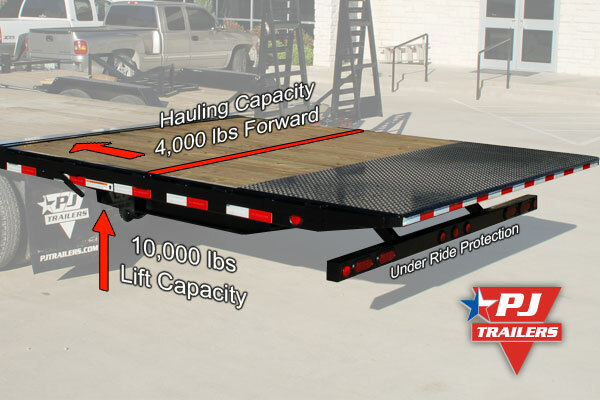 This option allows you to load and unload material from a side door located in front of the axles. 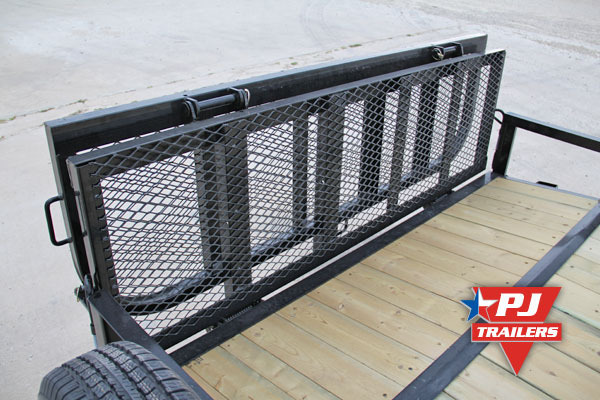 This door makes for easy access when shoveling out dirt/aggregate in the front of the bed. 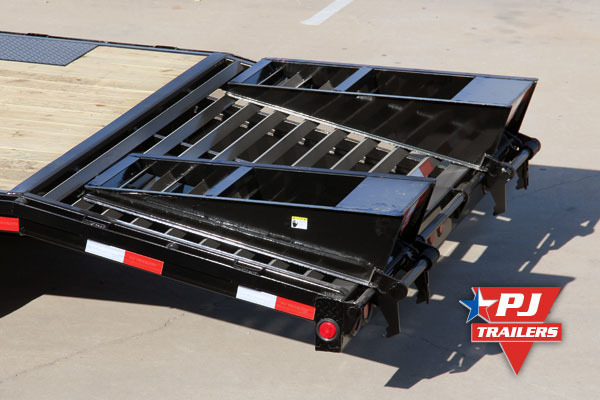 With a 49" wide opening on 16' dumps and 42" wide on 14' dumps it also gives you the ability to side load pallets. 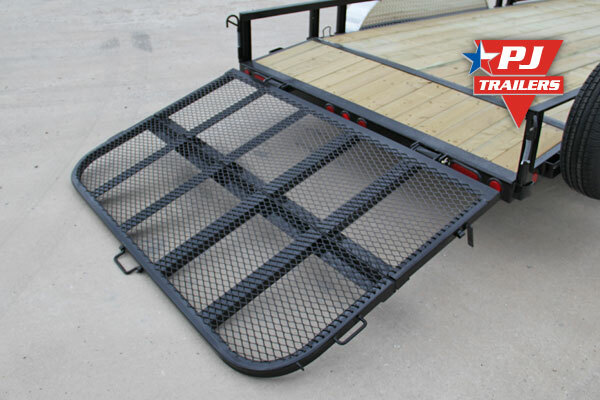 Gate opening for side-loading pallets, sod, large rocks, mulch bags, etc. 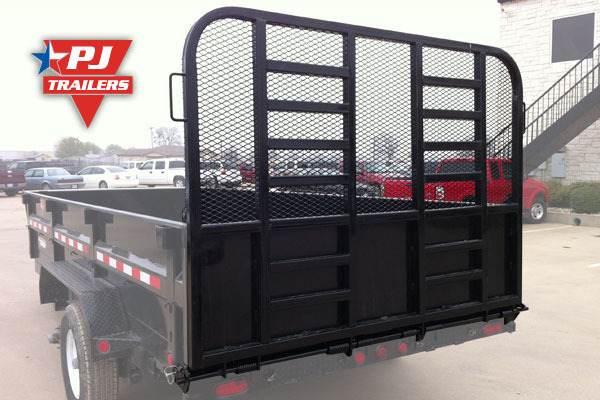 We offer a landscape gate on our 83" wide dump trailers (D7, D9, DJ, & DL). 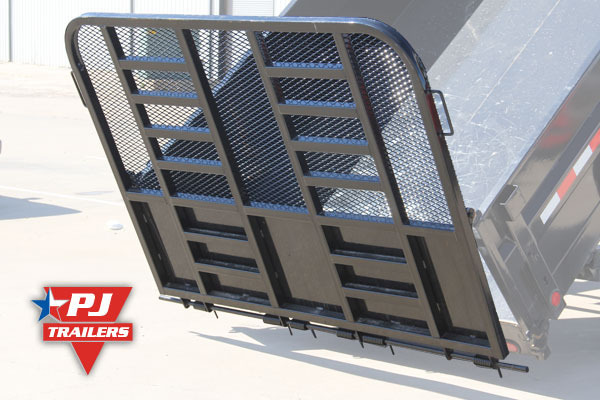 This gate allows you to load equipment in widths up to 83" and also use the gate to spread small aggregate. 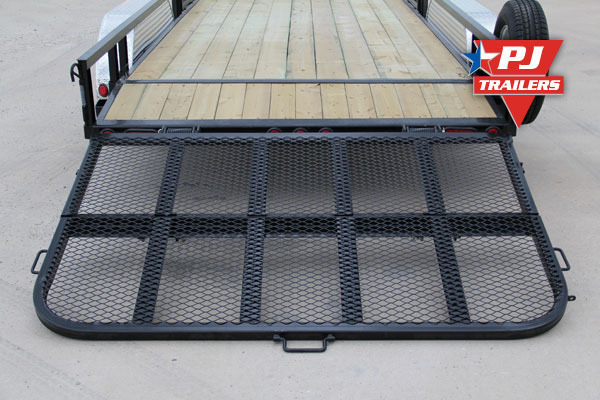 When ordered with dump landscape gate, trailer does not receive ramps. 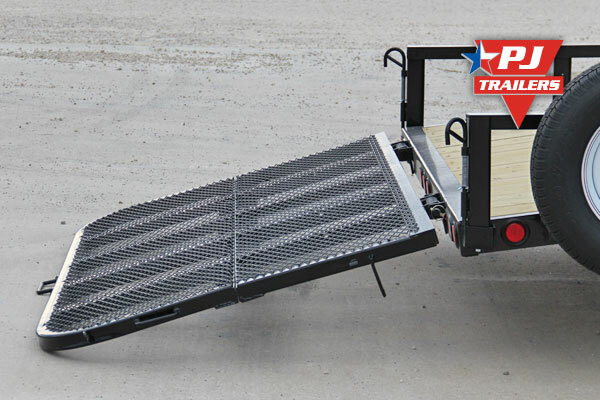 Our rolling tailboard is an excellent option for loading and unloading pipe, lumber, pallets, skids, and containers. 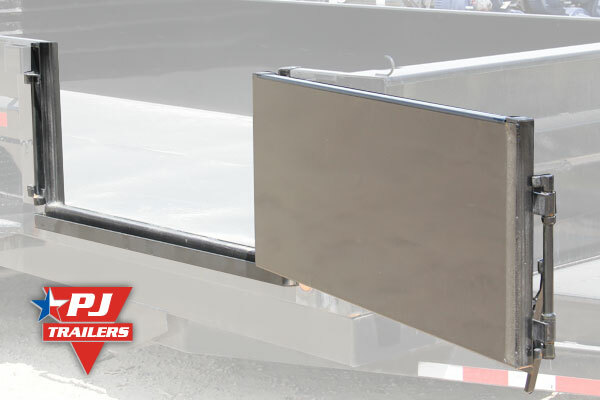 The roller pipe has a 4 5/8" outside diameter and the brackets are made of 1/2" steel. 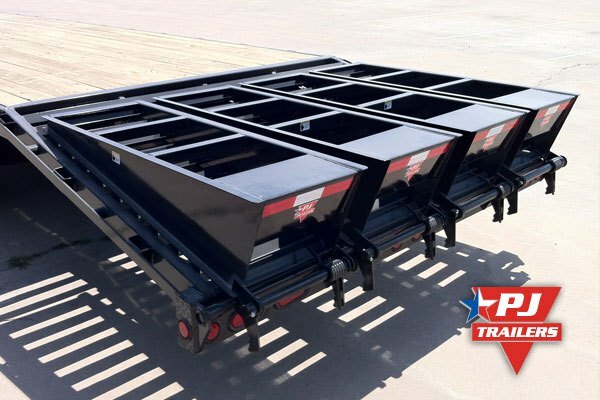 Roller pipe width is 91"
The 83" wide dump trailers now include a pre-drilled collar standard on the bottom of the rear bumper that makes this option very easy to add on. 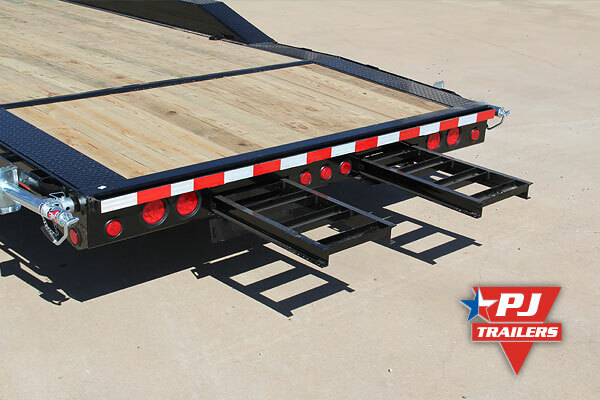 For the flat deck option a collar has to be added to the rear bumper (included in the price). 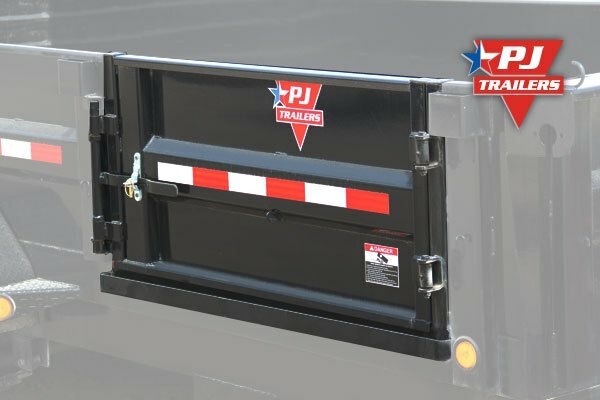 At PJ Trailers we not only created the first gooseneck hydraulic dovetail, we perfected it. 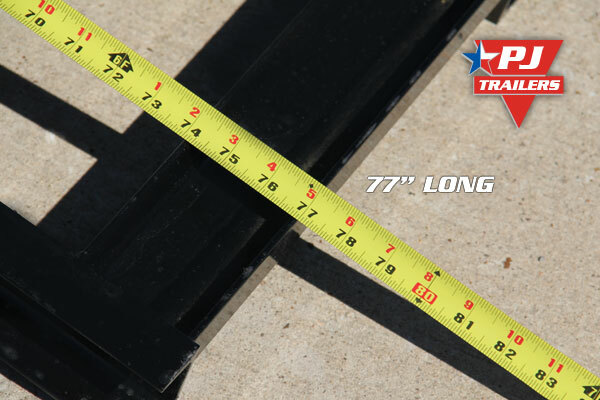 Our 10'' dovetail makes it extremely quick to load and unload heavy equipment. 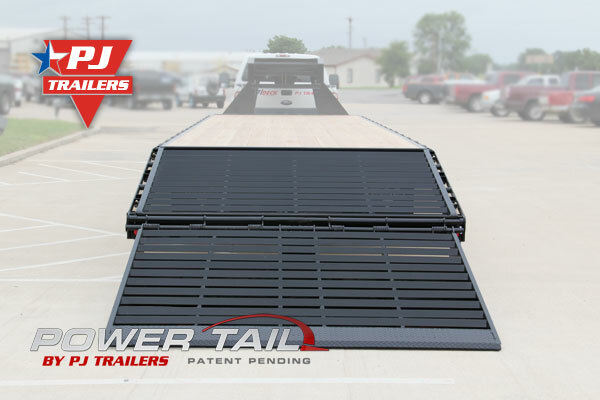 Want to load lower cars on your PJ car hauler or prefer wider ramps? 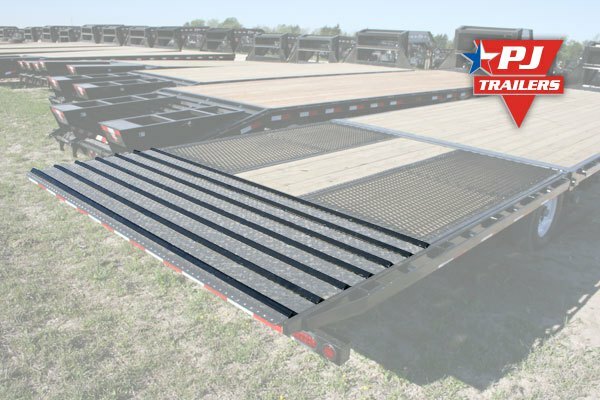 The XL rear slide-in ramps are the perfect ramps for you. 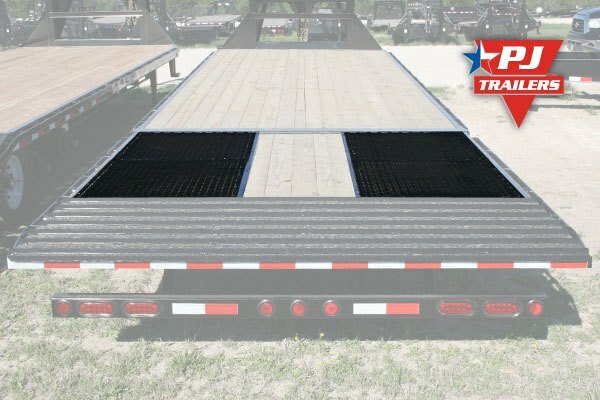 These ramps are 4" wider and 17" longer than the standard car hauler ramp. 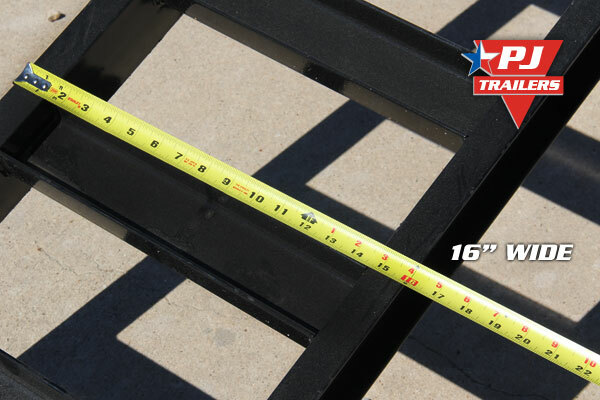 Due to the extra length, the load angle is reduced from 18 degrees to just 14 degrees. 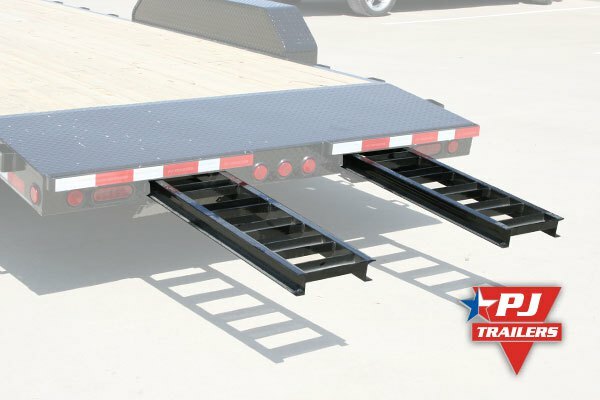 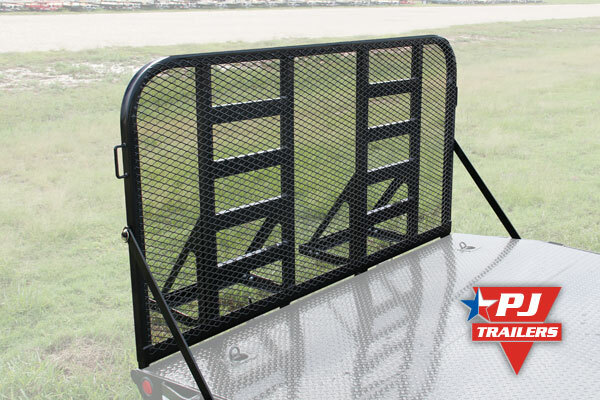 With rear slide ramps you no longer have to remove a ramp from the side of the trailer and carry it to the rear bumper. 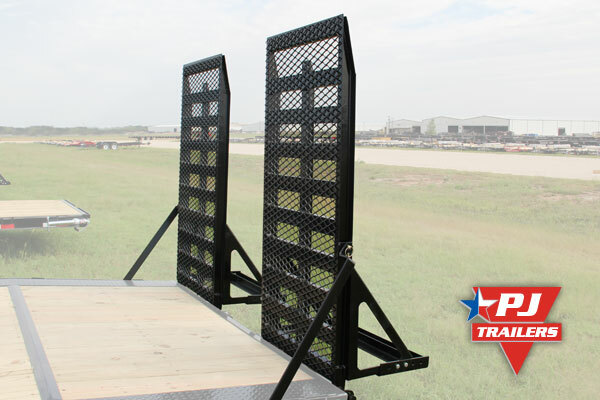 You simply open the rear ramp doors, slide your ramp out, and place it on the ramp support bar. 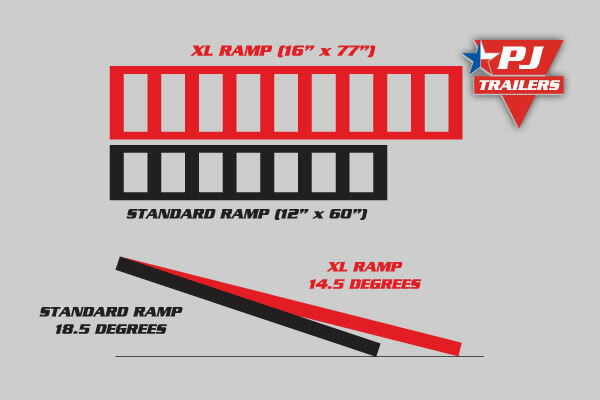 XL ramps are 4" wider and 17" longer than the standard 12" x 60" ramp. 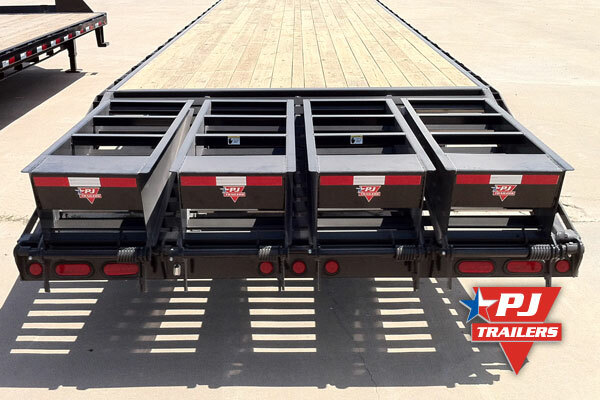 Tandem axle trailers must be 24 ft or longer, Triple axle trailers must be 34' or longer.